Either way, these policies rarely accomplish what policymakers intend them to do. An excise tax is an indirect tax, unlike a sales tax. It is when the manufacturer/producer of a certain good has to factor a fixed tax or percentage into the cost of that good and then pay the government the tax themselves. Excise taxes are specific to individual goods and activities, whereas sales taxes or income taxes are levied on a general base. Think of a pack of cigarettes or gasoline. Built into the advertised cost of those goods is a portion that is pure tax. A pack of cigarettes might cost $2, but 50 percent of its cost might be an excise tax levied by the local, state, or federal government, making the true cost $3. And that is before any sales tax. So which states have the biggest excise tax burdens? 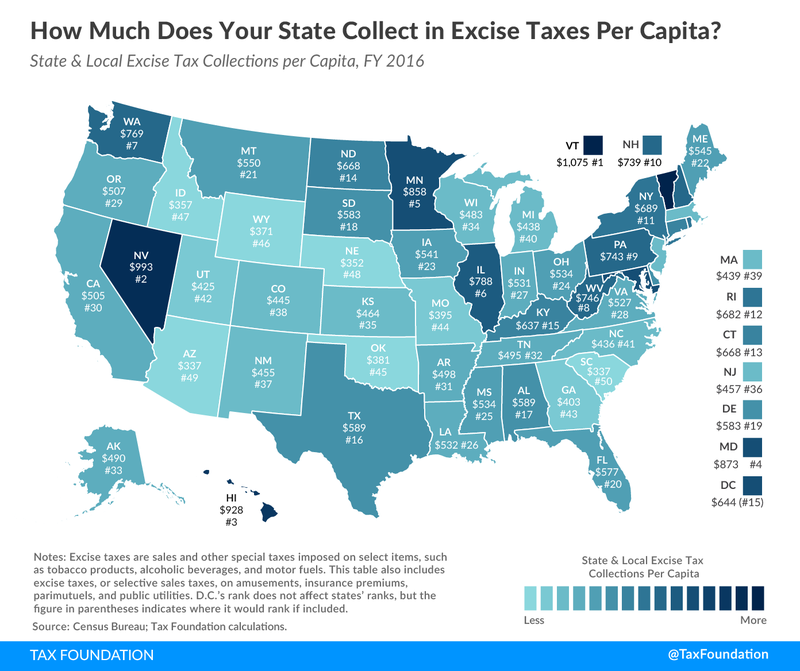 Check out the Tax Foundation’s recent study on how much each state collected in excise taxes per person in the fiscal year 2016. What Is so Onerous about Excise Taxes? Soda taxes have unintended consequences that make any impact on obesity negligible at best. Cigarette taxes are an unstable source of revenue. Excise taxes are levied on a relatively narrow tax base, and many regressive, with a larger share of the tax burden falling on those with lower incomes. So while many believe that levying taxes on unhealthy goods—which is determined by our benevolent politicians whom exercise wise judgement—is a good way to promote a healthy and virtuous citizenry, there is little evidence that suggests the taxes are accomplishing what they were set out to do. One great example of the failure of excise taxes is found in Philadelphia's “soda tax.” The tax was implemented in 2017 at 1.5 cents per ounce of a sugary drink, equal to $1 per typical two-liter bottle of soda (which is $1.56 pre-tax). The goal was to reduce obesity by discouraging consumption of sugary drinks by raising the prices, but the result was anything-but-intended. We draw several lessons about the effectiveness of local sweetened-beverage taxes from these analyses. First, the tax was ineffective at reducing consumption of unhealthy products. Second, in terms of revenue generation, the tax was only partly effective due to consumers substituting to stores outside of Philadelphia. Third, low income households are less likely to engage in cross-shopping, and instead are more likely to continue to purchase taxed products at a higher price at stores in Philadelphia. The lower propensity for low income households to avoid the tax through cross-shopping leads to a relatively larger tax burden for those households. In summary, the tax does not lead to a shift in consumption towards healthier products, it affects low income households more severely, and it is limited in its ability to raise revenue. And this case study is just one example of the same occurrences in numerous other places. At best, excise taxes simply shift the consumption of disincentivized “harmful” products to other areas where the goods are sold cheaper. At worst, excise taxes make goods more expensive for people (particularly poorer people) who will still buy the “harmful” products in their respective area. Either way, these policies rarely accomplish what policymakers intend them to do—unless, of course, the true goal of these taxes is simply to fund an increasingly costly and inefficient government apparatus.